The 1998 – 2002 Firebird is the 4th generation of this popular automobile. Striping this car requires precut stripes for the hood and basic 12″ striping for the remainder of the car. Because of the hood on this model the only kit that we have for this car is the precut one. This entry was posted in Stripes for Different Automobiles on February 11, 2013 by stevecole. The plain Firebird can use our precut stripe kit that is designed for the Trans Am and the Ram Air Firebird and our extended version of that kit that features a 6″ longer hood stripe (recommended). If you use the standard Ram Air / Trans Am kit the stripes will end on the hood before the intakes. The extended kit goes all the way to the front up to the inlets like in the picture below. Both these kits also include 20 feet of 12″ striping for the rest of the car. This model Firebird can also be striped with our standard cut to fit kits in 6″, 8″ or 10″ widths. The cut to fit kits come as a 30 or 36 foot roll of striping and a plastic squeegee. You can add pinstripes for $5 extra. 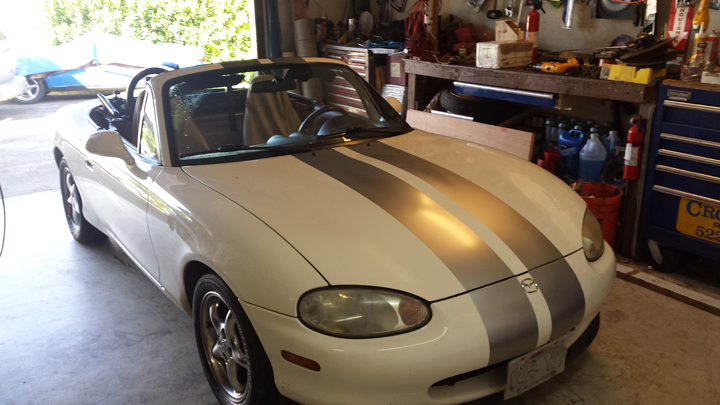 This entry was posted in Stripes for Different Automobiles on February 12, 2013 by stevecole. Trucks look good with wide stripes. 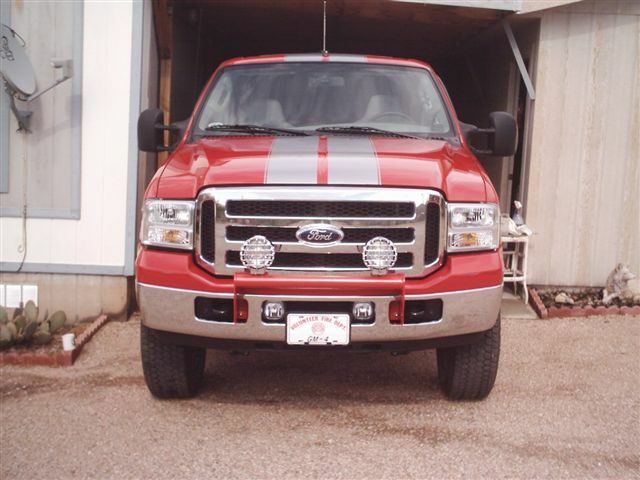 A 10 inch stripe kit or a 12 inch stripe kit will work well on any full size truck. Smaller trucks can go with a 10 inch or an 8 inch stripe kit. For trucks that want to stripe the hood, roof and tailgate a 30 foot kit is fine. If the truck has a hard bed cover then a 36 foot kit will provide more material. The best thing to do is measure the areas you wish to stripe and then purchase a little more material than you need. The truck above used an 10 inch stripe kit and added 1/4″ pinstripes. This entry was posted in Stripes for Different Automobiles on February 26, 2013 by stevecole. 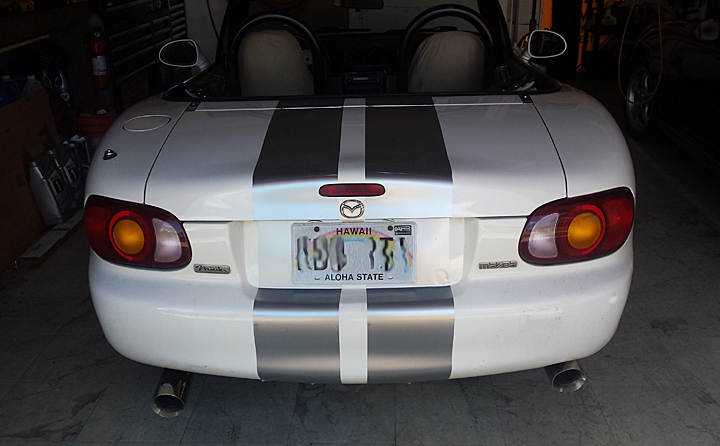 The Mazda Miata is a very popular car to stripe. 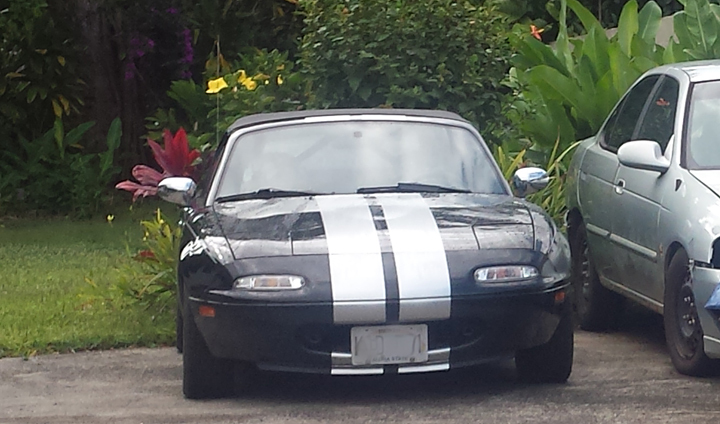 A striped Miata bears a slight resemblance to a Shelby Cobra. Cobra owners will not appreciate this but it is true. 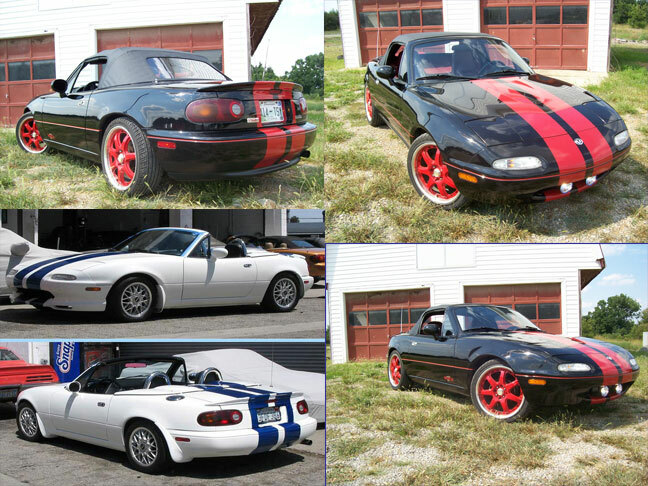 The most popular size stripe for the Miata is an 8″ stripe but a 6″ stripe kit is also popular. Pinstripes can be added to increase the width. Because the car is not long, a 30 foot kit is normally all you need to go down both bumpers. Lastly, some owners prefer a single 12″ stripe with pinstripes. This entry was posted in Stripes for Different Automobiles on February 17, 2013 by stevecole. This is the 2nd phase of the 4th generation of Ford Mustangs. It should be called the 5th generation in my opinion because of the complete redesign. 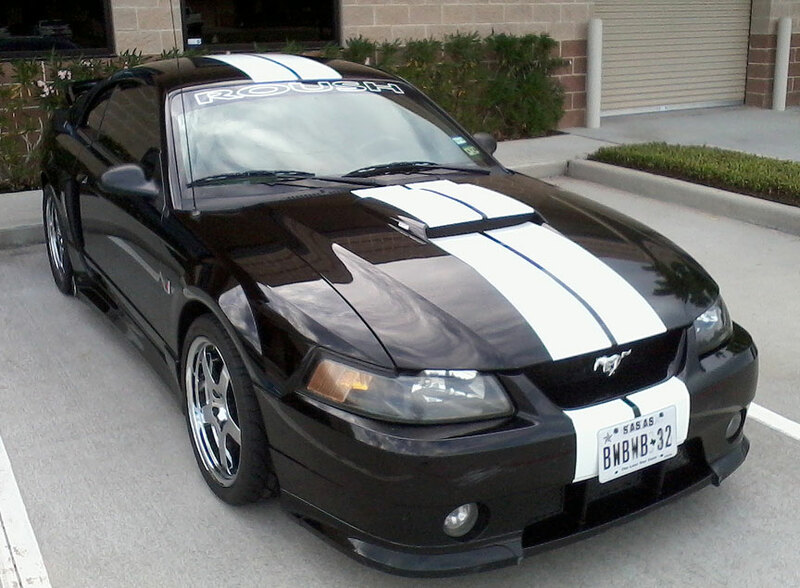 Because of the design of the hood, the 1999 – 2004 Mustang can handle 6″ stripes or 8″ stripes. For an even wider look pinstripes can be added to either kit. Anything wider than 8 inches will run wider than the hood scoop and make the installation difficult. GT hood cowl stripes are also perfect for this model. You can continue the GT cowl stripes back across the hood and rear deck by using 10″ striping. There are two hoods for this generation Mustang. One is the type below where the scoop points towards the windshield. The other is the more common one where the scoop points towards the front of the car. Both hold the same width stripes. This car below has the scoop facing the front bumper. The picture below is of 8″ stripes where they took a different color pinstripe and used it as trim. Looks good. The car below was striped with an 8″ x 36 foot kit with 1/4″ pinstripes. All done by the owner. This entry was posted in Stripes for Different Automobiles on February 15, 2013 by stevecole. Our customer was quoted $650 for 8″ stripes on his Roush Mustang. He did it himself for a little over $50. Turned out great. This model Mustang looks best with an 8 inch stripe kit but also looks fine with a 6 inch kit. We carry both kits at our online store www.vinylstripes.com . Going down the bumpers with a basic 8″ x 36 foot kit simply requires a little bit of splicing and trimming where the stripe goes from horizontal to vertical on the front and rear bumper. The adjusts for the convex curve of the bumper. 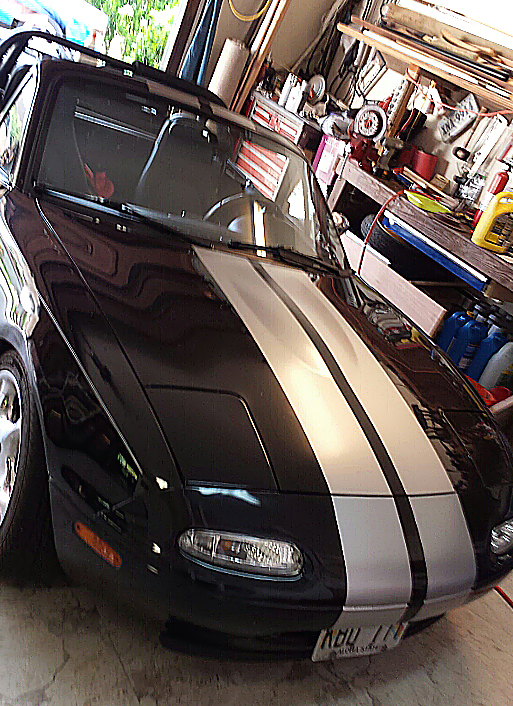 This entry was posted in Stripes for Different Automobiles on April 19, 2013 by stevecole. The 2005 through 2009 model Mustang would be the first phase of the 5th generation of Ford Mustangs. This was a complete redesign of the 2004 Model with the two cars bearing very little similarities. The 2005 was a retro type Mustang. This model was very well received by the public. This model really needs stripes to break up the large hood. Because of the large hood, owners have the choice to stripe the car with cut to fit 6 inch stripes, 8 inch stripes, 10 inch stripes or 12 inch stripes. The car below has the GT front bumper and trimming around the tag is not necessary. The car below is striped with a standard generic cut to fit 8″ kit. The owner did all of his own installation and trimming. Take a look at the car in the picture. Are the stripes painted on or are they vinyl? I will let you know at the end of this article. When deciding how to stripe your Camaro, Mustang, Charger or other automobile you have two basic choices, “painted on stripes” or “vinyl self adhesive stripes”. Both have pros and cons associated with them. Painted on stripes are normally created by a body shop/paint shop and will run anywhere from $500 to $2000 depending upon who does the job and the materials they use. To paint on stripes the shop will tape off the area to be striped exposing only where the paint will go. Then they will sand the area and spray it using either a standard or base coat/clear coat method. Painted on stripes will normally last longer than vinyl stripes. If done correctly with quality paint they should last as long as your paint does. Paint will conform over scoops and other uneven odd surfaces better than vinyl so for difficult coutours it is great. The downside to painted on stripes is the high cost and the fact that they are hard to alter or remove. If you are not pleased with how they turned out you are basically stuck with what you have. This applies to botched up striping jobs as well. I have experienced this first hand. I had a painter with what I was later to find out very poor eye sight paint stripes on my Jeep. They turned out ok other than the fact that one side was crooked which drove me crazy. Fixing them would have involved a lot of sanding and respraying which would ruin the blue paint as well. I chose to leave them the way they were but was never happy with the way it looked. If the stripes had been vinyl they would have been simple to fix. I would have simply pulled off the bad sections and replaced them. When your stripes need replacing they are easy to remove and easy to replace. To remove the striping simply heat with a hair dryer or heat gun, Peel the stripes off. Then remove any residue with Goo Gone or another adhesive remover. Another advantage of vinyl is that a computer is used for design work making it possible to integrate in curves, words and other elements that would be difficult to do using only paint. Plus if you want to add more graphics to your car such as rocker panel striping the same vinyl film can be used to for a perfect match. In summary, professionally painted on stripes should be considered when contours and obstacles make vinyl impractical. Other than that, vinyl makes more sense from a practical and budgetary standpoint. For the cost of one set of painted stripes you can buy at least 10 sets of vinyl stripes. If you have any questions please feel free to email me at steve@reflectivestore.com. The stripes on the car in the picture are vinyl. If fact they were applied by a customer who had never applied stripes before. Nice job. This entry was posted in General Articles on Car Striping on February 8, 2013 by stevecole. 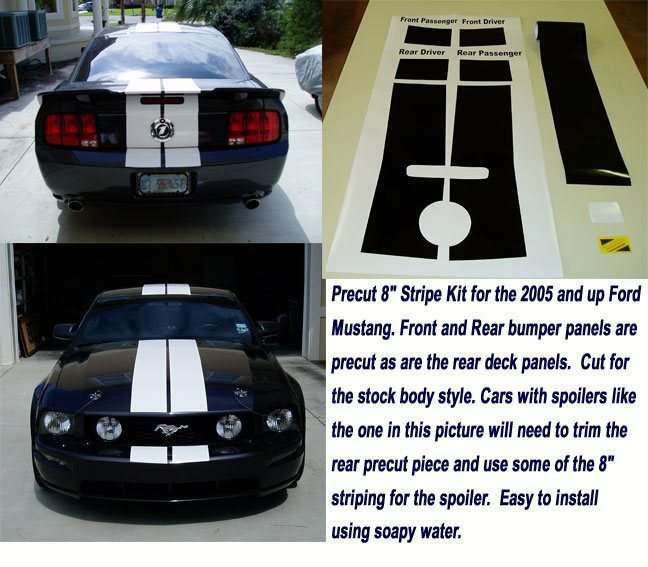 Step 1 – To install our stripe kits first take a pair of scissors and cut the striping into the lengths you need to stripe the hood, roof, trunk and bumpers (if you are striping the bumpers) of your car. I always make each piece slightly longer than I need and then trim it or fold it under the edge of the area it is being applied to. (example – front of the hood) The stripe will need to be dry before you fold it under. Step 3 – Thoroughly clean the application area with rubbing alcohol and a soft cloth. Step 5 – I generally mark the center of the car and then run masking tape from the front to the back of the car. If I need the stripes to be one inch apart I would use one inch wide tape. For a two inch gap use 2 inch tape or use 1″ and come off of it a half inch on each side. Step 6 – After I mark where the stripes will go I spray the car with soapy water then I peel the backing off the stripe and spray the adhesive side of the stripe with the soapy water also. (TIP – lay the striping down shiny side down and peel the paper backing off of the stripe, not the stripe off of the paper backing. This helps to prevent you from accidentally kinking the material. Then spray the sticky side which will be facing up with soapy water and then handle the stripe. Step 7 – Position the stripe where you want it and slide it into place. For longer sections is it helps to have a second person help. Step 9 – Repeat this process on all stripes and then trim any excess vinyl away with an exacto knife or razor blade. The video below shows the wet application method using Rapid Tac. Mild soapy water works the same way. Also, he uses pieces of tape to line up the stripes. I normally use a solid piece right down the middle of the car. The video below shows an alternative wet method where the stripe is partially taped down and installed 1/2 at a time. Note that the squeegee is wrapped with a soft cloth to prevent scratching.